With the support of UNICEF, the Trincomalee District Child Protection Committee (DCPC) held a one-day workshop to further strengthen its activities in the district. Ms Gabriela Elroy, Head of Office, UNICEF Trincomalee, inaugurated the workshop in the Trincomalee district secretariat together with Additional Government Agent, Mr.N. Singarayer, and Provincial Commissioner Probation and Childcare, Mrs. N.R. Ranjini, sources said. Mr. Sajeeva Bandaranayake from UNICEF, Colombo, facilitated the main part of the workshop. 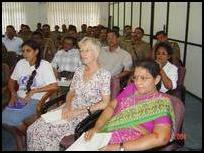 Participants included among others over thirty police officers from Trincomalee and Kantale, Probation Officers, Child Rights Promotion Officers, Samurdhi Managers and representatives from the Human Rights Commission. Mrs. N.R. Ranjini, Commissioner for Probation and Childcare, Dr (Mrs.) P.K.Gnanagunalan, the Medical Superintendent of the Trincomalee General Hospital, Dr. G. Gnanagunalan, Acting Deputy Provincial Director of Health Services and Attorney-at-Law Mr. K. Sivapalan, Co-ordinator of the Legal Aid Foundation also participated in the workshop. The District Child Protection Committee receives complaints from the public relating to child abuse and refers these to the appropriate authorities. The DCPC seeks to promote child rights throughout the district, sources said. 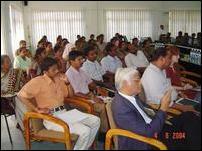 Following the workshop, the Government Agent of Trincomalee, Mr. M.D.A.G. Rodrigo co-chaired a DCPC meeting in the afternoon along with Mrs. N.R. Ranjini. The DCPC will be chaired by either the Government Agent or the Commissioner Probation and Childcare. A Planning Officer from the Kachcheri and a Child Rights Promotion Officer were appointed as coordinators for the Trincomalee District DCPC and it was decided that they would be released a couple of hours per day from their regular duties to co-ordinate DCPC activities throughout the district. This workshop is part of UNICEF’s ongoing support to strengthen the district DCPC. This support includes material development, trainings and supplies to the future DCPC desk at the GH hospital, UNICEF sources said.